On our seashore pastures and fields whooper swans still forage and Branta geese are till met too. A splendid view when the magnificent birds swim in the water pools in the fields, surrounded by green and white patterned ground, reddish brown birch thicket in the background – not really a Christmas time description. The slight and brief frost and snow did not make them go southwards. Passing migrants even from south Finland can be expected and some will certainly stay for the winter. 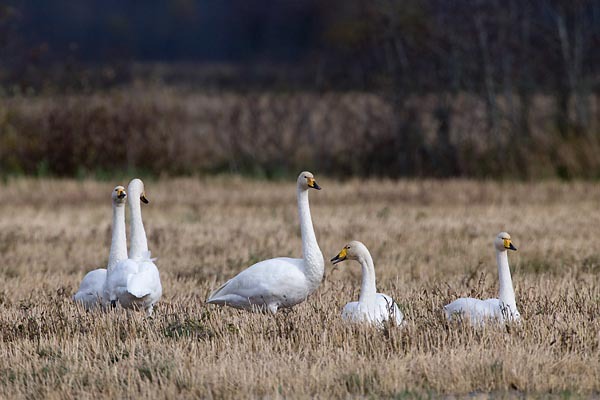 In appearance they are similar in size to mute swans, with a straight neck and a slim look. The beak base of adult birds is broadly yellow, the tip black; the beak base of young birds are pinkish. Whooper swans don’t bend their necks and do not raise the wing feathers as mute swans do. The young birds of this year hav a brownish-grey plumage. Passing migrants in autumn are up to ten thousand birds. The large, powerful birds have no enemies in nature, white-tailed eagles sometimes come to harass them, looking whether there might be some old or weaker or injured bird.